Air-conditioning gas leak is definitely one of the worse nightmare for owners due to the high difficulty of tracing the leaks source. Even when leaks source are found, some areas are unreachable making it extremely difficult for technician to repair. Refrigerant Leak Detector is needed for air conditioning gas leak problem. Air-conditioning gas leak problem is an extremely difficult and costly in solving it. An initial step to identify gas leak is by checking the gas pressure level with a pressure meter. If the pressure meter shows zero, that is the sign of gas leak because the compressor can never be emptied. 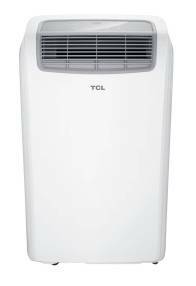 The air-condition technician will then pump in the freon, either R22 to 68PSI or R410a to 135PSI to the air-conditioner, this depend on what refrigerant your air-conditioner takes in. You can check what refrigerant your air-conditioner takes in by looking at the label beside the fan coil unit. From there, the technician will monitor the gas level. If the pressure drops within a few days, weeks or even months, this is a confirmation sign of gas leak because if the gas is top-up fully, it will last at least for a year. The rate of leaking is also dependent on the size of the crack. So where is the leak source usually occur? The leak can be at the fan coil, inside the condenser or the copper pipes. The cracks are usually found at the joint soldering portion and copper pipes near the compressor. The crack occurs when two copper pipes touch each other and due to the vibration of the running compressor, the copper pipes will crack and gas leak occurs. 1. Hand-Held Refrigerant Leak Detector which detects a leak. A beep sound will be heard when it touches the copper pipe. 2. Ultraviolet (UV) Dye which detects a leak by inserting a coloured dye into the copper pipe and the colour will show where the leak is. 3. Soap and Water. Bubbles will form when the soap and water is placed on the copper pipe that leak is suspected. 4. 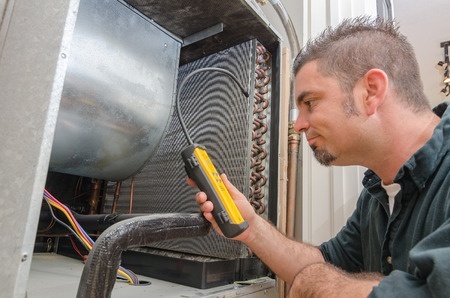 Pressure Test is by cutting the whole air-conditioning system into portion and adds a pressure meter to it. For example, pressures test on a split air-conditioning system. We cut the system into 3 portions. The fan coil, the condenser and the copper pipes between the fan coil and the condensers. Each portion is inserted a pressure meter on it. Observe it for few weeks. If any of the pressure meter shown significant drop of Freon, is the portion that leaks. 1. Soldering is a process in which two or more metal items are joined together by melting and filling the leak area with a filler metal. In the methods and equipment mention above, fixing the leak may sound simple. But in fact, gas leaks are extremely hard to detect and seal. Especially if the leak source is in the copper pipes, it is almost impossible to detect the leak as it is concealed inside the wall, and it is very hard to perform soldering to seal up the leak source.